I was thrilled when I got the chance to try OdorKlenz SPORT. I have been playing sports (aka suffering from bad-smelling shoes) since I was little, and it seems like any kind of physical activity tends to leave some kind of unpleasant odor in shoes, socks, workout shorts, etc. While my Pilates attire certainly does not have a smell quite like my cleats from youth soccer, I would not call the smell pleasant. 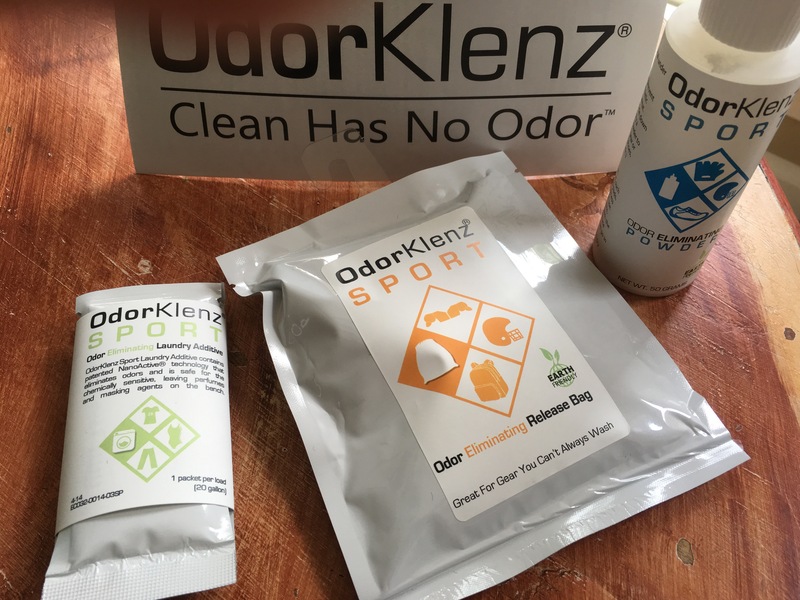 Needless to say, it is impossible to wash a lot of gear right away, which makes the OdorKlenz SPORT powder and SPORT release bag great options when you are on the go. I know I am planning to pack both on my next trip–I always bring workout clothes on vacation, but they end up stinking up everything in the suitcase! 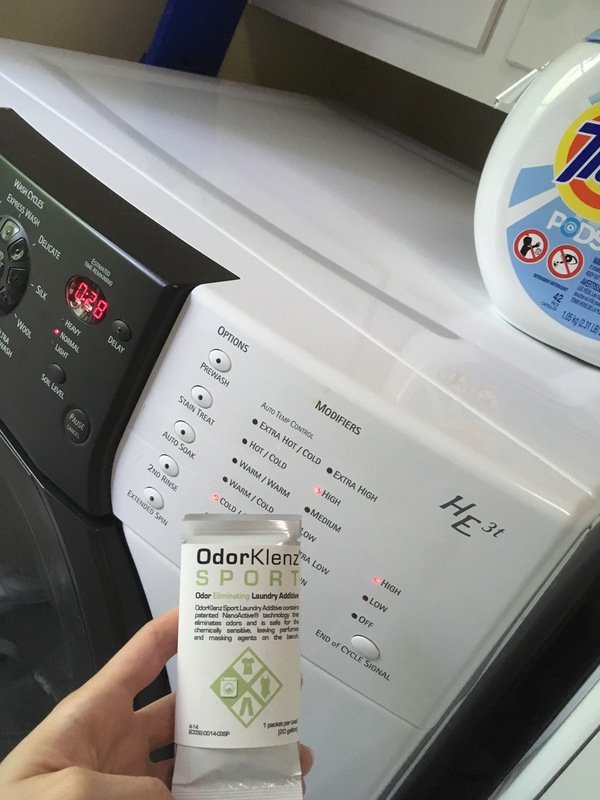 I love using bags to organize clothing for vacation, and the fact that this product helps eliminate odor is even better. I even tried the powder in my Dad’s shoes (shhh..) and I can attest from pre- and post-testing that they do smell much better. The powder comes out of the bottle evenly (so often these bottles dump out a ton of powder at once, which drives me crazy) and is free of perfumes and masking agents, making it safe for even the most sensitive skin. It relies on zinc oxide as a natural, non-toxic deodorizer and just a few dabs of the powder did the trick. I can’t wait to use this in my tennis shoes, gym bags, and even using it to wipe down my Pilates mat. The laundry additive works in conjunction with your regular laundry detergent to go the extra mile to get ride of the extra-strength smell! As you can see from the detergent I use (Tide Free and Clear) my skin is highly sensitive to fragrances and additives, so I can rest easy knowing that this product contains no masking agents or added fragrances, just like the sport powder! You just add one packet per load at the beginning of the wash cycle and it’s done! I am so glad I found these products and cannot wait to keep using them. My nephew plays tons of sports (I love to brag on his soccer skills) and I know that little boy cleats always have a special scent so I will have to share with his mom too. They even have a pet shampoo and and pet litter additive to minimize unpleasant animal odors! The litter additive is next on my must-try list; anyone with three cats knows how quickly the smell of the litter box can take over the whole house! I love the products, and the company has great customer service is wonderful and stands by everything with a 30-day money back guarantee. Which product do you want to try first? Disclaimer: I was sent my Odorklenz SPORT kit as part of a Fresh Press Media Campaign. All opinions remain my own! I use Tide free and clear as well. Its the only thing that doesn’t make me itch. I Sprinkle my shoes and stinky things with baking soda and find it absorbs the order rather well (and its dirt cheap) but I’m sure that product works even better. OOh this looks amazing! I have to check it out! This post made me laugh. The daily struggle for athletes is real! Ohh I’ll definitely have to try this! Looks like a great product!